This weeks secret ingredient kind of threw me for a loop. The problem? I don’t like beets! But you know what? This isn’t the first time I’ve used an ingredient I didn’t like! Way back when, sweet potatoes were chosen. I don’t like sweet potatoes, or so I thought! I came up with Sweet Potato Pillows in a spicy red pepper cream sauce – and I loved it! I have to give Tony full credit for the idea of this recipe – thanks Tony! 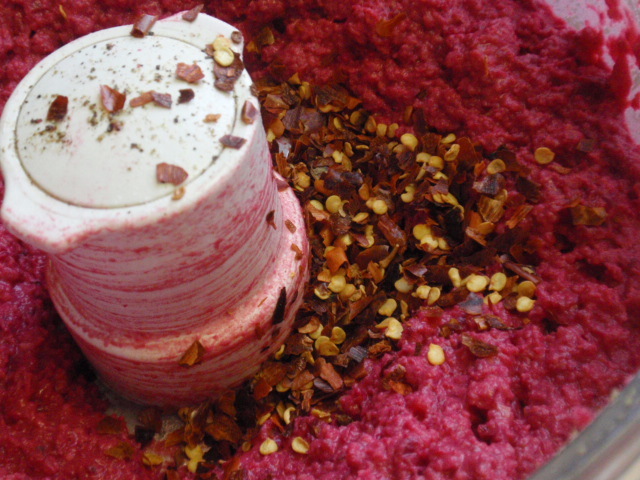 Cook beets for 30 minutes on top of the stove until tender over low heat. 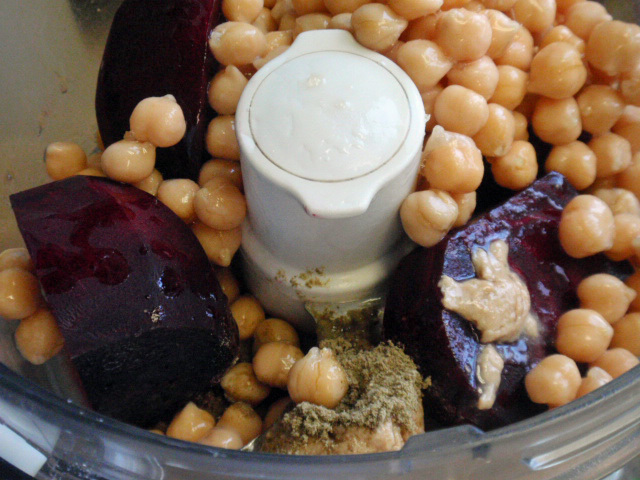 Cool, peel and put everything in a food processor and blend until smooth. Refrigerate. 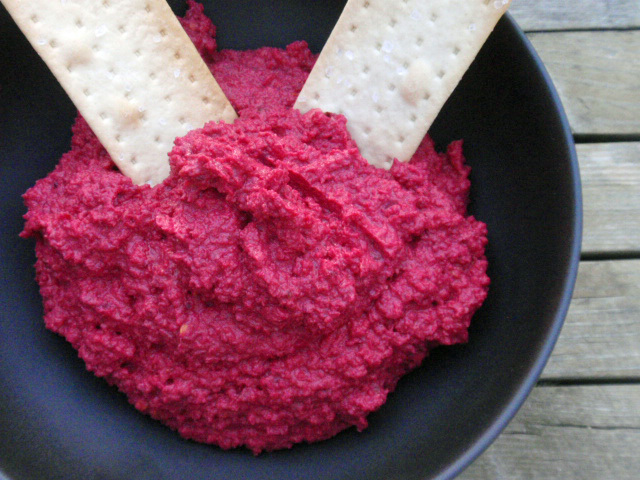 Serve with raw vegetables and crackers. After the first taste, I decided it needed a little heat – that’s when I added the crushed red pepper – perfect! 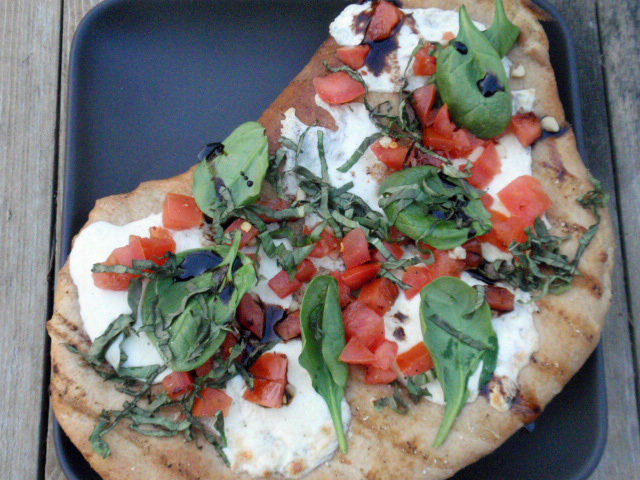 Since I had leftover dough from last night’s spinach pizza, and I had seen Cory’s grilled caprese pizza, I knew I would be grilling pizza! 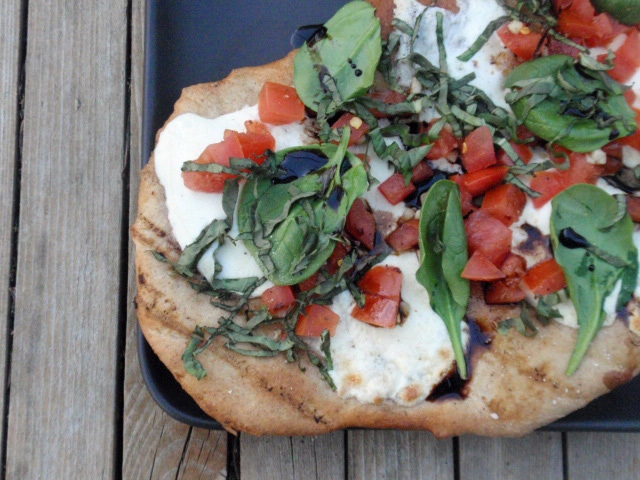 It’s weird, it’s the same dough as last night, but grilling pizza gives a whole new texture to the dough – almost light? Hannah was my outdoor kitchen assistant! 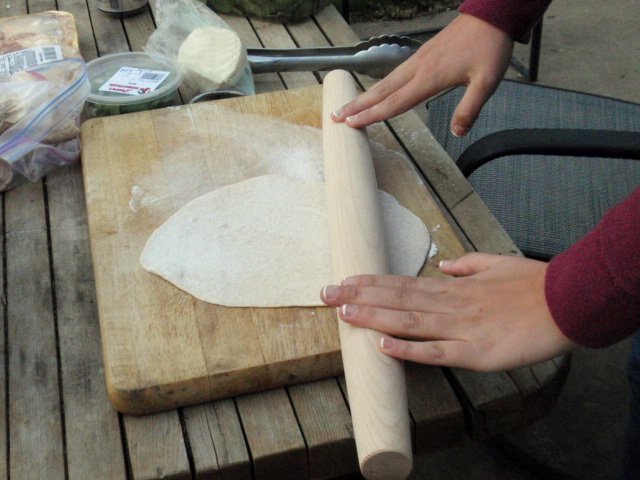 One word of advice – this goes pretty quickly, so make sure you have all of your ingredients on hand. I bake it naked, and then after the first flip, but my ingredients on and put the lid on until the cheese melts. 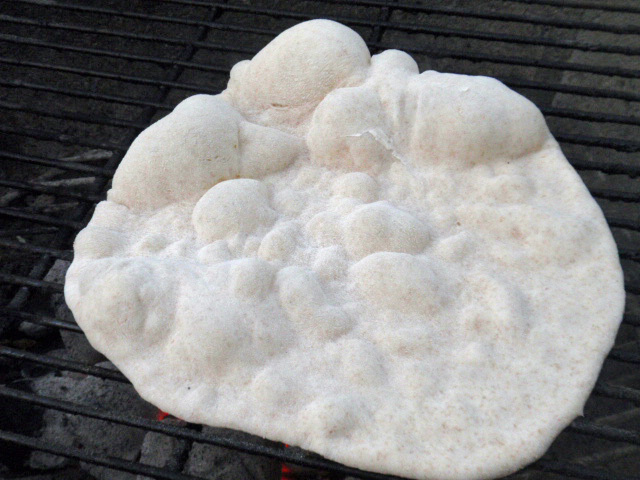 And using a coal grill, it is best to have direct and indirect heat, so put your coals to one side, otherwise your dough will burn before the cheese melts. My beverage of choice last night? 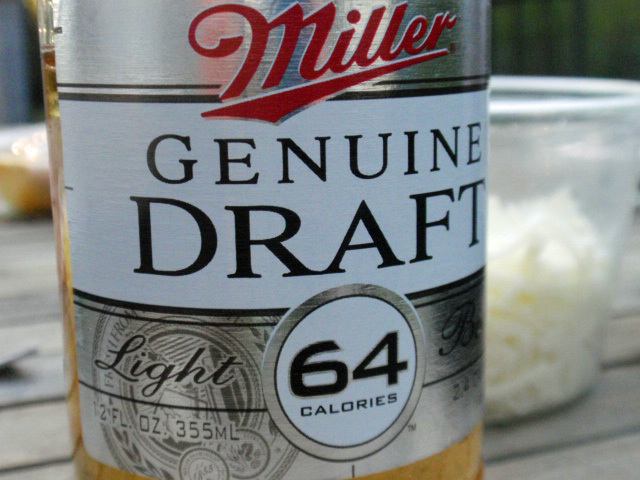 64 calorie beer, which isn’t too bad – I just add a section of lime to it and that really helps! 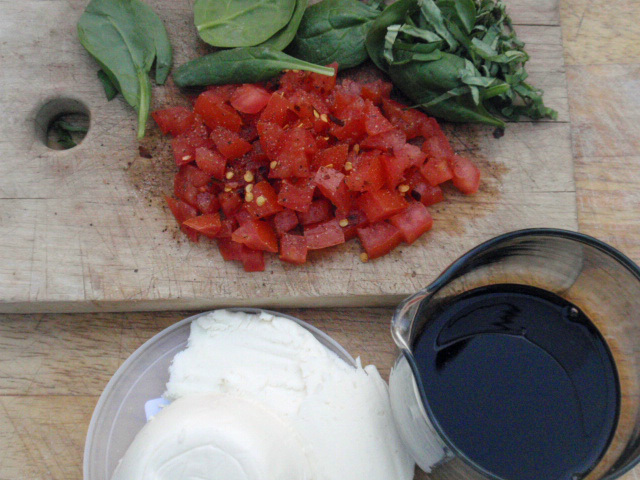 My pizza is a deconstructed version of Cory’s, simply because I don’t like whole tomatoes – I seeded and diced up one roma tomato, had spinach, fresh basil and fresh mozzarella cheese. But you know what makes this pizza? The balsamic reduction. Hands down brings this pizza to a whole other level! 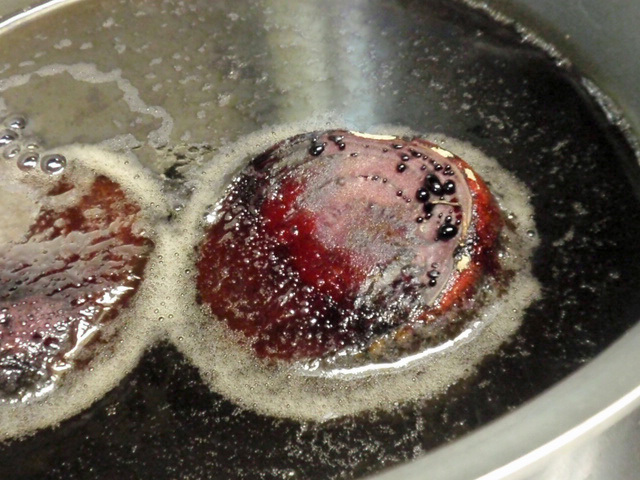 Simply take 2/3 cup of balsamic vinegar and bring to a light boil, stir for about 5 minutes and remove from the eat. 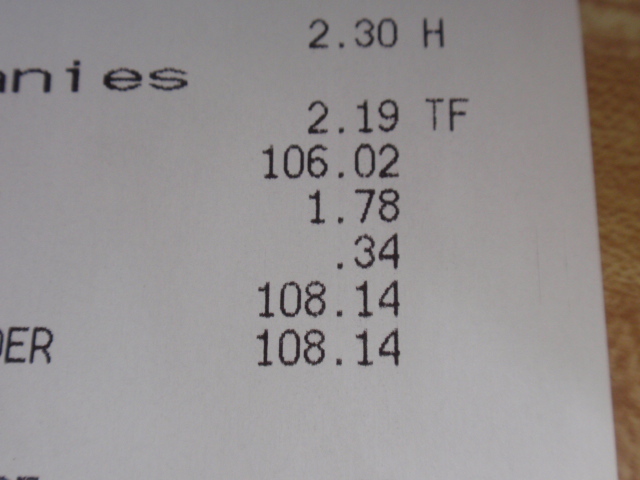 It reduces down to almost a syrup like consistency. What are your plans today? I am meeting up with my Momma for lunch at Sweet Tomatoes and then hitting up Sam’s Club with her. It looks like another beautiful day! !